Pam’s Pictorama Photo Post: This is an incredibly tiny photo – only about 2″x2″ cut from something larger. It was at one time pasted into an album, perhaps a page of many, small cut out images in a 1920’s collage. This Felix is a familiar Schoenhut model toy which was hugely popular. Someone has plunked our friendly Felix toy down on the front end of this gorgeous looking early Chevrolet. Ironically Felix has a notable history with Chevy, thanks to a long lived dealership in Los Angeles. I touched on this in a post called Felix Sells, after being inspired by a single early dealership envelope which I saw on eBay, but failed to purchase. As I am not especially knowledgable about cars, I cannot hazard a guess about the model of this one and therefore the possible year completely eludes me. Still, we can assume that it was while Felix was first hitting the big time and star that he was, he was simply everywhere. These abound for sale on eBay and I have never purchased one, in part, because it would need to be mounted. (Remember, our cramped studio apartment does not allow for a lot of construction projects or tools.) If I see a nice mounted one I would love it. Felix is at his early squared off best, portrayed in his thinking/pacing mode. I do very much like the idea of him on the prow of my car! This one is resplendent – in fully painted glory. Generally you see an unpainted version (and modern castings) available. Painted version of the Le Jeune Felix hood ornament, not in the Pictorama collection, alas! From a Hake’s sale catalogue. Another version of a Felix hood ornament, shown below, came up while researching this. Not sure of the maker or year. One can imagine this one in fully original shiny brass glory however – wowza! There were another few variations where a metal Felix had been married to another ornament in a homemade version. I was unable to capture those. Still here he is in his thinking walk; he seems far less concerned however. This Felix is strolling. All this to say, it would have been an easily understood joke of the day to take a Felix toy and stick it on the front of your Chevy and take the photo I have acquired. Although somewhat less popular today, hood ornaments still exist. I have a friend who has a nice one of a beaver on the front of her car and he has graced the front of a series of her SUV’s as I understand. A similar but more widespread practice today seems to be tying old stuffed animals to the front of trucks, something I have wondered about. Perhaps it comes out of an entirely different motivation. If I owned a car (which would require that I drive a car – really another story) I would consider affixing this Felix with his bent, thoughtful walk to the hood. After all, contemplation is good and speed isn’t everything. Felix side view – check out the whiskers! It is almost beyond my imagination to consider such a wonderful world where candy might have been delivered in such a container into the happy and greedy hands of children. These roly poly toys do not appear to be in short supply so children must have liked Felix more than the candy. In the mugshots above, you can just barely see that he maintains part of a Schoenhut sticker on his tummy and to my especial amazement, he has kept his whiskers all these years! If Felix was not your roly poly of choice, you could have Santa, goblins, golliwogs, fat men and bunnies – among others. I do own some other black cat candy containers (covered in mohair) made in Germany. Alas, they are packed away and will have to await their moment in the spotlight at some future date. Roly poly toys seem to have been around for a long time but I could not find out much about their origin. It seems that numerous cultures – Russian, Chinese and European – actually have versions of the toy. Quite simply, the toy is weighted and rounded on the bottom so if you push it over it bounces right back up. I guess this was devised for small children to entertain themselves with since they couldn’t actually knock it over. Wikipedia sites Weebles (by the Fischer Price company with the memorable tagline, Weebles wobble but they don’t fall down!) as a contemporary manifestation of the roly poly. They do not mention the bottom-heavy, blow up knockdown clown toys of my youth which I adored. As big as a small child (I found the sheer size thrilling – I always liked big toys) you could sidle on up to it and give it a poke and it would go down – and bounce right back up! Wonderful! I think I could go out and buy one now and still enjoy it. Pam’s Pictorama Toy Post: This Schoenhut Felix is very common, but I like the size and heft of mine. He is about eight inches high, and he came to me in an unusual way. I received a call from an acquaintance of Kim’s who was traveling, in Florida I believe, who said he saw an old Felix in a store and asked if he should buy it for me. I have never taken a chance on such a blind acquisition before, but on that day I rolled the dice and I got this guy for a great price. 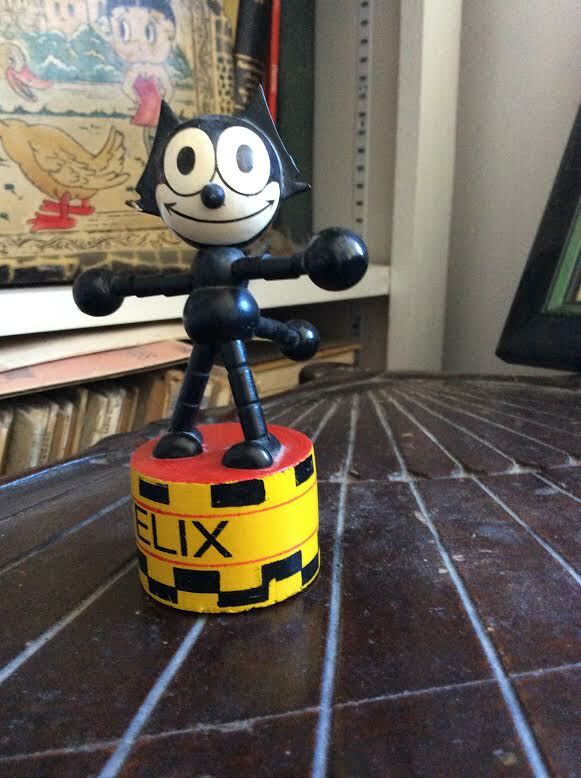 Even all these years after his heyday, this Felix toy is virtually ubiquitous as old toys go. They frequently appear in photos with children, often with babies. I do not have any in my collection, because I prefer the more idiosyncratic stuffed toys. The wooden ones are widely available, although not especially inexpensive, in a variety of sizes and some variation. Felix is posable, although this one has started to grow fragile and like so many you see, the twine that holds him together is threatening to break. I believe that somewhere, for a large sum of money, you can have them restrung. I imagine new they were relatively indestructible however. The extreme popularity of this toy is somewhat mystifying for me. He is a hard wooden toy, not cuddly. While he is nicely posable, it is hard to imagine that explaining his fascination for kids. Frankly, this fellow mostly looks good on a shelf like mine – among his kind and ken – dozens of different variations. In fact, Felix’s vast allure over many decades is hard to explain – even for devoted fans like myself. However, the ongoing appeal of Felix cannot be denied. Below is a photo of a small toy of more recent vintage (I believe I acquired him in the 1980’s, long, long before my collection was even a twinkle in my eye) which is also very popular. A small variation on the Schoenhut theme which I give for your consideration.